We have successfully generated two substrate-specific γ-secretase assays. Both cell-based assays presented here are designed to quantify γ-secretase enzymatic activities via the output of firefly luciferase reporters. Wang, B. J., Wu, P. Y., Chen, Y. W., Chang, Y. T., Bhore, N., Wu, P. F., Liao, Y. F. Quantitative Measurement of γ-Secretase-mediated Amyloid Precursor Protein and Notch Cleavage in Cell-based Luciferase Reporter Assay Platforms. J. Vis. Exp. (131), e56795, doi:10.3791/56795 (2018). We have developed a pair of cell-based reporter gene assays to quantitatively measure γ-secretase cleavage of distinct substrates. This manuscript describes procedures that may be used to monitor γ-secretase-mediated cleavage of either APP-C99 or Notch, using a Gal4 promoter-driven firefly luciferase reporter system. These assays were established by stably co-transfecting HEK293 cells with the Gal4-driven luciferase reporter gene and either the Gal4/VP16-tagged C-terminal fragment of APP (APP-C99; CG cells), or the Gal4/VP16-tagged Notch-ΔE (NΔE; NG cells). Using these reporter assays in parallel, we have demonstrated that an ErbB2 inhibitor, CL-387,785, can preferentially suppress γ-secretase cleavage of APP-C99 in CG cells, but not NΔE in NG cells. 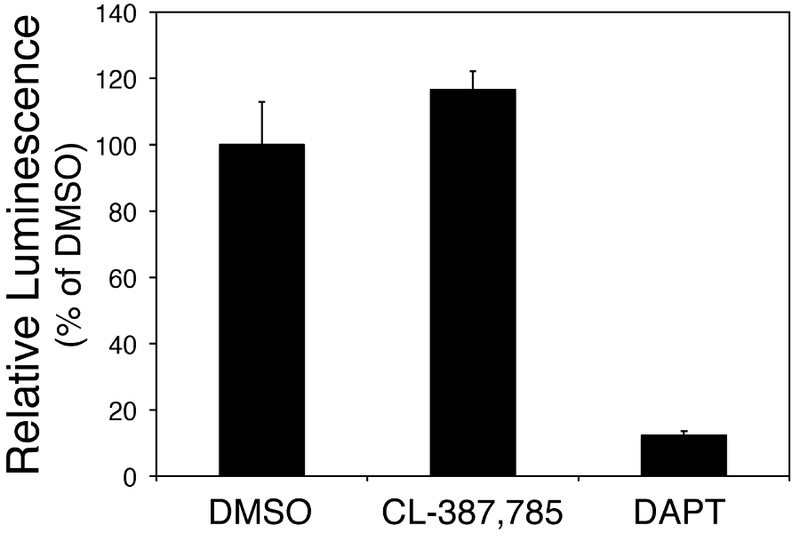 The differential responses exhibited by the CG and NG cells, when treated with CL-387,785, represent a preferred characteristic for γ-secretase modulators, and these responses are in stark contrast to the pan-inhibition of γ-secretase induced by DAPT. Our studies provide direct evidence that γ-secretase activities toward different substrates can be differentiated in a cellular context. These new assays may therefore be useful tools in drug discovery for improved AD therapies. Oligomeric forms of amyloid-β (Aβ) are believed to be the primary cause of neurodegeneration in the brains of patients suffering from Alzheimer's disease (AD)1. Aβ peptides are produced by the stepwise cleavage of amyloid precursor protein (APP), first by β-secretase and then by γ-secretase2. In the past decade, therapeutic approaches toward treatment of AD have focused on the prevention of Aβ production3. The majority of studies have focused on either the augmentation of α-secretase activity, which can preclude γ-secretase cleavage of APP and thereby decrease the production of Aβ, or the inhibition of β-and/or γ-secretase activities4. Unfortunately, non-selective inhibition of β- or γ-secretases results in unavoidable side effects that are due to interference with the functioning of other physiological substrates of β- and γ-secretase5,6. With regard to γ-secretase inhibitors, recent studies have reported the discovery of a number of chemical and genetic modulators that can regulate Aβ production while exerting negligible effects on the essential γ-secretase-mediated processing of Notch7,8,9,10,11,12, however, successful therapeutics have not yet been developed. Thus, further systematic screens are warranted to discover novel genetic and chemical modifiers that may selectively modulate γ-secretase-mediated APP processing. γ-Secretase is known to cleave more than 90 different membrane-anchored proteins. Among these substrates is Notch, whose activity is critical for cell fate determination and differentiation during development13. Selectively modulating γ-secretase-catalyzed APP processing in the absence of affecting Notch processing will be essential for minimizing Notch-related side effects of γ-secretase inhibitors, and this selectivity is thought to be a primary factor that will dictate the biological efficacy of potential γ-secretase modulators for the chronic treatment of AD. There have been a number of arylsulfonamide derivatives, such as GSI-953 (begacestat) and BMS-708163 (avagacestat), that have been found to exhibit potent and selective inhibition of γ-secretase14,15. A previous study has demonstrated that the differential inhibition of γ-secretase cleavage of APP and Notch can be observed using a quantitative ELISA-based assay in combination with in vivo validation using zebrafish16. Furthermore, cell-based assay paradigms have been established to address the potential substrate selectivity of γ-secretase toward APP and Notch17,18. Using protocols similar to those described herein, we have recently discovered a novel class of (D)-leucinamides that potently modulate γ-secretase cleavage of APP with Notch-sparing selectivity19. Together, this collection of studies provides a proof-of-concept supporting the notion that the substrate selectivity/availability of γ-secretase can be subject to chemical modulation and experimental verification. However, these assay platforms often rely on relatively low-throughput readouts and labor-intensive approaches that might not meet industrial standards for drug discovery programs. We have recently generated cell-based luciferase reporter gene assays that can quantitatively determine the catalytic activity of γ-secretase toward two distinct substrates, the 99-amino acid C-terminal fragment of APP (APP-C99) and the extracellular domain-deleted Notch peptide (NΔE). Both APP-C99 and NΔE have been widely used as direct substrates of γ-secretase in various assays. To generate homogeneous and consistent luciferase reporter gene assays for the γ-secretase cleavage of either APP-C99 or NΔE, we generated one HEK-derived stable cell line (CG) that constitutively expresses a Gal4 promoter-driven firefly luciferase reporter (Gal4-Luc) and Gal4/VP16-tagged APP-C99 fusion protein (C99-GV). In addition, we generated another HEK-derived stable cell line (NG) that constitutively expresses Gal4-Luc and Gal4/VP16-tagged NΔE (NΔE-GV). Using these novel substrate-specific γ-secretase assays, we now provide a method to quantify and distinguish the catalytic activity of γ-secretase toward distinct substrates (APP-C99 in CG cells, or NΔE in NG cells). Moreover, the substrate-specific γ-secretase assays were designed to be conducive to high-content screening platforms. These newly generated γ-secretase assays could pave the way for the discovery of novel γ-secretase modulators that could improve cognitive function by suppressing Aβ production without eliciting undesirable Notch inhibition for the next-generation treatment of AD. NOTE: Please refer to the previous publications for detailed descriptions of the generation of CG and NG cells20,21. Seed NG or CG cells (20, 000 cells/well) onto 96-well microplates at a final volume of 200 μL/well in growth medium that is composed of Dulbecco's Modified Eagle Medium (DMEM) plus 10% fetal bovine serum (FBS), 5 μg/mL blasticidin, 250 μg/mL antibiotic (e.g., zeocin), and 200 μg/mL hygromycin B. Count cells with a hemocytometer. Transfer the microplates to a humidified CO2 incubator and incubate at 37 °C overnight. Remove 100 μL of growth medium from each well. Add 100 μL/well of growth medium containing 2 μg/mL tetracycline with either 0.2% dimethyl sulfoxide (DMSO), 2 μM CL-387,785, 2 μM N-[N-(3,5-difluorophenacetyl-L-alanyl)]-S-phenylglycine t-butylester (DAPT), or other related ErbB1/ErbB2 inhibitors. Incubate treated CG or NG cells in microplates at 37 °C for 24 h.
Remove 150 μL/well growth medium from microplates. Add 50 μL/well luciferase assay reagent (please see Table of Materials). Transfer the microplates to a luminescence microplate reader. Maintain the microplates at room temperature for 5 min with gentle agitation. Determine the Firefly luciferase (FL)-emitted luminescence using a pre-defined program stored in the luminescence microplate reader. Open the instrument control software (see Table of Materials for instrument details). From the 'Tool' menu, select 'Luminometry'. Under the 'Parameters' settings, choose 'No filter' for Emission Filter, tick 'Normal' for Emission Aperture, enter '1' for Counting Time, and click on 'OK' to set up the luminescence reading. Under the 'Instrument control' tab, scroll through the list of active protocols, and select the pre-stored protocol for reading luminescence. Under the 'Live display' tab, define the Scale from the pull-down list, and select 'Logarithm' or 'Linear' for the Type. Under the 'Temperature' tab, select 'Off' for Plate heating. Click the 'Start' button to perform the luminescence reading. As needed, export results into a spreadsheet format using the 'Explorer' embedded within the control software. Define a luminescence signal emitted by CG or NG cells treated with 0.1% DMSO in growth medium containing 1 μg/mL tetracycline alone as 100% relative γ-secretase activity. Estimate background luminescence from CG or NG cells by treating cells with growth medium that does not include tetracycline. Normalize luciferase signals from CG or NG cells that are cultured with growth medium containing 1 μg/mL tetracycline and either 1 μM CL-387,785 or 1 μM of DAPT with the luciferase signal emitted by DMSO-treated CG or NG cells (100% relative γ-secretase activity, as defined in 2.1). To establish a cell-based assay that can quantitatively measure the proteolytic cleavage of a particular γ-secretase substrate, we generated the HEK293-derived CG cell line by stable co-transfection of a tetracycline-inducible C-terminally Gal4/VP16-tagged APP-C99 and a Gal4 promoter-driven firefly luciferase reporter gene. A parallel NG cell line was also established to assay for the γ-secretase cleavage of NΔE. In NG cells, a tetracycline-inducible C-terminal Gal4/VP16-tagged NΔE and a Gal4 promoter-driven luciferase reporter gene were stably co-transfected into HEK293 cells. The γ-secretase cleavage of APP-C99 in CG cells and the γ-secretase cleavage of NΔE in NG cells were first confirmed by treating CG and NG cells with various concentrations of DAPT, a pan γ-secretase inhibitor that blocks the cleavage of all γ-secretase substrates (Figure 1). The data also demonstrated that γ-secretase in CG andNG cells exhibited comparable levels of catalysis. To validate the efficiency of the substrate-specific cell-based assays for γ-secretase cleavages, we examined the luminescence signals in CG and NG cellstreated with an ErbB1/2 dual inhibitor CL-387,785, which has been shown to differentially modulate γ-secretase cleavage of APP-C99 and NΔE21. We previously identified CL-387,785 as a selective γ-secretase modulator due to its interference with the protein-protein interaction between presenilin-1 (PS1) and C99 and lack of interference with the interaction between PS1 and NΔE21. 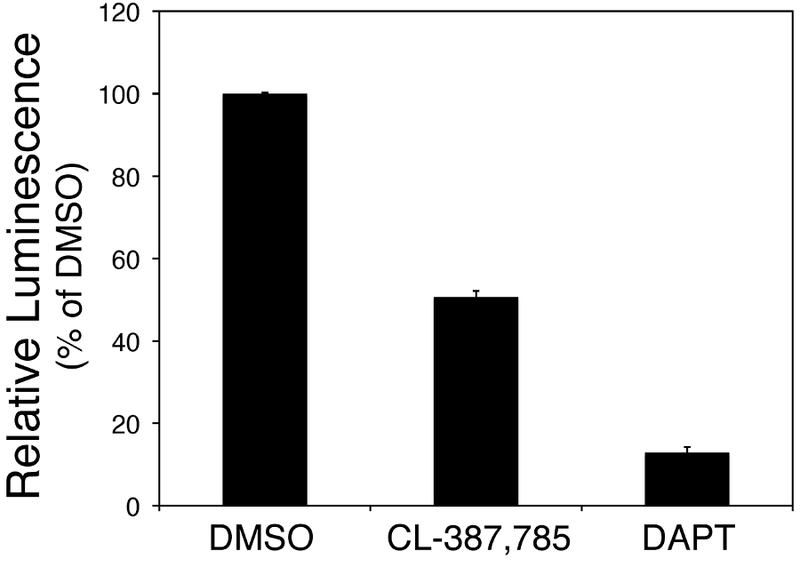 Here, data show that treatment with CL-387,785 effectively blocked the processing of APP-C99 in CG cells, whereas the proteolysis of NΔE in NG cells was not affected (Figure 2). These results demonstrate the effectiveness of CG and NG cells in distinguishing between C99 and NΔE cleavage, in a format that is conducive to high-throughput screening platforms. Figure 1: The APP-C99-specific cellular γ-secretase assay (CG cells). CG cells were seeded onto 96-well microplates (20,000 cells/well) overnight and treated with 1 μM of CL-387,785 or DAPT in the presence of 1 μg/mL tetracycline at 37 °C for 24 h. The luminescence derived from γ-secretase-mediated proteolysis of C99-GV was quantified after the addition of 100 μL/well luciferase assay reagent. The luciferase signal emitted by cells treated with vehicle alone (0.1% DMSO) was set as 100% relative luminescence. Data are shown as the mean ± SD from three independent experiments. Please click here to view a larger version of this figure. Figure 2: The Notch-specific cellular γ-secretase assay (NG cells). NG cells were seeded onto 96-well microplates (20,000 cells/well) overnight and treated with 1 μM of CL-387,785 or DAPT in the presence of 1 μg/mL tetracycline at 37 °C for 24 h. The luminescence derived from γ-secretase-mediated proteolysis of NΔE-GV was quantified after the addition of 100 μL/well luciferase assay reagent. The luciferase signal emitted by cells treated with vehicle alone (0.1% DMSO) was set as 100% relative luminescence. Data are shown as the mean ± SD from three independent experiments. Please click here to view a larger version of this figure. The promising outcomes from a phase 1b trial of aducanumab immunotherapy for AD have firmly established the critical role of Aβ in the pathogenesis of AD22 and suggest that anti-Aβ approaches are still a viable strategy for the development of anti-AD drugs. Here, we describe cell-based assays for quantifying γ-secretase-catalyzed proteolysis of APP-C99 and NΔE using firefly luciferase reporter systems. APP-C99 and NΔE are the two most well-studied γ-secretase substrates and together represent both the pathogenic and physiological activities of γ-secretase13. Our findings that downregulation of ErbB2 by CL-387,785 can preferentially reduce the steady-state levels of APP-C99 and secreted Aβ are further substantiated by the substrate-specific cellular assays of γ-secretase described in the present study. The current protocol thus provides an efficient approach for the discovery of novel γ-secretase modulators. The merits of this γ-secretase substrate-specific assay paradigm are multifaceted. For example, these substrate-specific γ-secretase assays could be utilized in a preliminary screen to rule out potential non-selective γ-secretase inhibitors from further development, and provide a quantitative assessment that is relevant to minimizing potential side effects. The biological efficacy of active compounds identified from this method can then be further validated in neuronal cells and animal models of AD, as demonstrated in recently21. Additionally, the homogeneity of the CG and NG stable cell lines is critical to the reproducibility of our experimental results. Importantly, the tetracycline-inducible expression of C99-GV or NΔE-GV effectively prevents the saturation of luciferase reporter expression that is seen in other systems where C99 or NΔE is constitutively expressed. This tetracycline-inducible expression results in a highly reliable and consistent luciferase signal that directly correlates with γ-secretase activity, allowing the comparison of γ-secretase cleavage activities between two different substrates (APP-C99 versus NΔE), or from experiment to experiment in an highly efficient manner. In order to obtain the best results, the activity of tetracycline solution should be monitored periodically (preferably once per month) to ensure optimal induction efficiency. As an added advantage, the homogeneity of these platforms eliminates the need for normalizing firefly luciferase with constitutive Renilla luciferase expression. Finally, treating CG and NG cells with 1 µM avagacestat, a known Notch-sparing γ-secretase inhibitor, can serve as a positive control for the assay. One possible caveat of using the present assay platform is that the overexpression of γ-secretase substrates and subsequent saturation of the transcriptional reporter in our assays has some potential to mask inhibitory activity and contribute to discrepant inhibitory potency among the different assays23. This potential complication underscores the need of secondary assay platforms to validate the efficacy of Notch-sparing γ-secretase inhibitors, as shown recently21. Another potential limitation of this approach is that given more than 90 different membrane proteins have been identified as γ-secretase substrates, the present assay platforms do not provide a complete profile of γ-secretase substrate selectivity. Along these lines, sparing the inhibition of Notch cleavage may not be the best readout with which to evaluate γ-secretase inhibitors. Caution should be taken due to the fact that avagacestat, a Notch-sparing γ-secretase inhibitor, fails to improve cognition24, and it is likely that Notch inhibition might not be the only basis for toxicity associated with pan γ-secretase inhibitors25. The true utility of hits identified by this new approach could hinge upon if the newly identified Notch-sparing γ-secretase inhibitors possess novel chemical entities that are not present in avagacestat, and if the efficacy of these inhibitors can be validated using in vivo models of AD. In conclusion, we believe that the presented approach may greatly expedite the development of APP-C99-specific γ-secretase inhibitors/modulators for clinical use. There is no denial that γ-secretase inhibitors, whether they are Notch-sparing or not, could potentially initiate toxicity in AD patients, which would lead to undesirable tolerability and outcomes as previously suggested26. However, with the introduction of new chemical tools and improved validation schemes21, γ-secretase should continue to be an appealing drug target due to its biochemical complexity, requiring more preclinical and clinical studies to explore its therapeutic relevance in AD. The authors thank the Core Facility of the Institute of Cellular and Organismic Biology, Academia Sinica, for technical support. This study was supported by the Ministry of Science and Technology, Taiwan (MOST 103-2320-B-001-016-MY3 to Y.-F. L.), the Program for Translational Innovation of Biopharmaceutical Development – Technology Supporting Platform Axis Scheme (NP7 to Y.-F.L. ), and Academia Sinica (to Y.-F.L.). Selkoe, D. J., Hardy, J. The amyloid hypothesis of Alzheimer's disease at 25 years. EMBO Mol Med. 8, (6), 595-608 (2016). Wolfe, M. S., Guenette, S. Y. APP at a glance. J Cell Sci. 120, (Pt 18), 3157-3161 (2007). Karran, E., Mercken, M., De Strooper, B. The amyloid cascade hypothesis for Alzheimer's disease: an appraisal for the development of therapeutics. Nat Rev Drug Discov. 10, (9), 698-712 (2011). Citron, M. Alzheimer's disease: strategies for disease modification. Nat Rev Drug Discov. 9, (5), 387-398 (2010). Vassar, R., Kovacs, D. M., Yan, R., Wong, P. C. The beta-secretase enzyme BACE in health and Alzheimer's disease: regulation, cell biology, function, and therapeutic potential. J Neurosci. 29, (41), 12787-12794 (2009). Parks, A. L., Curtis, D. Presenilin diversifies its portfolio. Trends Genet. 23, (3), 140-150 (2007). Kukar, T. L., et al. Substrate-targeting gamma-secretase modulators. Nature. 453, (7197), 925-929 (2008). Kounnas, M. Z., et al. Modulation of gamma-secretase reduces beta-amyloid deposition in a transgenic mouse model of Alzheimer's disease. Neuron. 67, (5), 769-780 (2010). Thathiah, A., et al. The orphan G protein-coupled receptor 3 modulates amyloid-beta peptide generation in neurons. Science. 323, (5916), 946-951 (2009). Flajolet, M., et al. Regulation of Alzheimer's disease amyloid-beta formation by casein kinase I. Proc Natl Acad Sci U S A. 104, (10), 4159-4164 (2007). Eisele, Y. S., et al. Gleevec increases levels of the amyloid precursor protein intracellular domain and of the amyloid-beta degrading enzyme neprilysin. Mol Biol Cell. 18, (9), 3591-3600 (2007). He, G., et al. Gamma-secretase activating protein is a therapeutic target for Alzheimer's disease. Nature. 467, (7311), 95-98 (2010). Haapasalo, A., Kovacs, D. M. The many substrates of presenilin/gamma-secretase. J Alzheimers Dis. 25, (1), 3-28 (2011). Gillman, K. W., et al. Discovery and Evaluation of BMS-708163, a Potent, Selective and Orally Bioavailable gamma-Secretase Inhibitor. ACS Med Chem Lett. 1, (3), 120-124 (2010). Hopkins, C. R. ACS chemical neuroscience molecule spotlight on Begacestat (GSI-953). ACS Chem Neurosci. 3, (1), 3-4 (2012). Yang, T., Arslanova, D., Gu, Y., Augelli-Szafran, C., Xia, W. Quantification of gamma-secretase modulation differentiates inhibitor compound selectivity between two substrates Notch and amyloid precursor protein. Mol Brain. 1, 15 (2008). McKee, T. D., Loureiro, R. M., Dumin, J. A., Zarayskiy, V., Tate, B. An improved cell-based method for determining the gamma-secretase enzyme activity against both Notch and APP substrates. J Neurosci Methods. 213, (1), 14-21 (2013). Basi, G. S., et al. Amyloid precursor protein selective gamma-secretase inhibitors for treatment of Alzheimer's disease. Alzheimers Res Ther. 2, (6), 36 (2010). Liao, Y. F., Tang, Y. C., Chang, M. Y., Wang, B. J., Hu, M. K. Discovery of small molecular (D)-leucinamides as potent, Notch-sparing gamma-secretase modulators. Eur J Med Chem. 79, 143-151 (2014). Liao, Y. F., Wang, B. J., Cheng, H. T., Kuo, L. H., Wolfe, M. S. Tumor necrosis factor-alpha, interleukin-1beta, and interferon-gamma stimulate gamma-secretase-mediated cleavage of amyloid precursor protein through a JNK-dependent MAPK pathway. J Biol Chem. 279, (47), 49523-49532 (2004). Wang, B. J., et al. ErbB2 regulates autophagic flux to modulate the proteostasis of APP-CTFs in Alzheimer's disease. Proc Natl Acad Sci U S A. 114, (15), E3129-E3138 (2017). Sevigny, J., et al. The antibody aducanumab reduces Abeta plaques in Alzheimer's disease. Nature. 537, (7618), 50-56 (2016). Golde, T. E., Koo, E. H., Felsenstein, K. M., Osborne, B. A., Miele, L. gamma-Secretase inhibitors and modulators. Biochim Biophys Acta. 1828, (12), 2898-2907 (2013). Coric, V., et al. Targeting Prodromal Alzheimer Disease With Avagacestat: A Randomized Clinical Trial. JAMA Neurol. 72, (11), 1324-1333 (2015). Mitani, Y., et al. Differential effects between gamma-secretase inhibitors and modulators on cognitive function in amyloid precursor protein-transgenic and nontransgenic mice. J Neurosci. 32, (6), 2037-2050 (2012). Penninkilampi, R., Brothers, H. M., Eslick, G. D. Pharmacological Agents Targeting gamma-Secretase Increase Risk of Cancer and Cognitive Decline in Alzheimer's Disease Patients: A Systematic Review and Meta-Analysis. J Alzheimers Dis. 53, (4), 1395-1404 (2016).